How to perform the test To test the hardness of a mineral, try to scratch the surface of your unknown sample with a mineral or object from the hardness scale listed above. If the unknown sample can not be scratched by the known mineral or object, the hardness of your sample is greater. 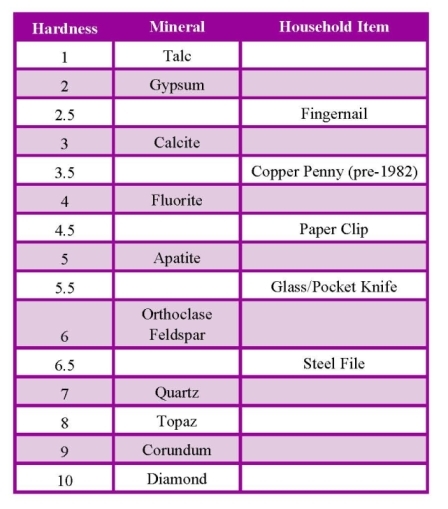 For example, if your sample was not scratched by fluorite, the hardness of your unknown sample is greater than 4. If your sample was scratched by apatite then you know the hardness of your sample is less than 5. Therefore, the actual hardness of your sample would be between 4 and 5. Mohs’ Hardness Scale Trivia: The first nine minerals on the Mohs’ Hardness Scale have nearly the same relative hardness between them. For example, fluorite is four times harder than talc, quartz is seven times harder than talc and corundum is nine times harder than talc. However, the tenth mineral on the scale, diamond, is 40 times harder than talc. Talk about your hard gemstones!